Should a Sniffle Keep Visitors Away from the Elderly? ← How Can Home Health Care Help a Senior Suffering Pneumonia? Elderly Care Germantown TN – Should a Sniffle Keep Visitors Away from the Elderly? 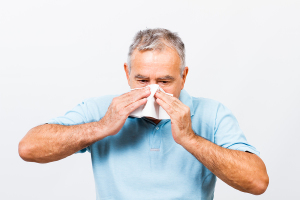 The elderly are among the highest risk groups for complications related to influenza. In fact, the Centers for Disease Control and Prevention (CDC) states that up to 85 percent of deaths related to the flu occur in people aged 65 or older. Because flu is so dangerous for seniors, it’s important for family caregivers and elderly care providers to protect them from the flu. If a guest with symptoms arrives, be sure to seat the elderly adult as far from them as possible and take additional steps to prevent the spread of the virus. Get a Flu Vaccination: The CDC recommends that seniors receive an annual flu vaccination. In addition, those who are frequently around older adults should also be vaccinated. Wash Hands: Remind your aging family member to wash their hands frequently, especially if they have been out in public where they may come into contact with germs. Keep hand sanitizer handy. Don’t Touch the Face: Ask seniors to try not to touch their eyes, nose, or mouth since that can spread germs. Disinfect Surfaces: Carry disinfecting wipes to wipe off shopping carts or other public surfaces that may have germs on them. At home, wash and disinfect surfaces as well. Adopt Healthy Habits: Helping older adults to stay in good general health can make them better able to fight off the flu virus. A combination of healthy eating, exercise, and drinking plenty of fluids will help. If your loved one does come down with the flu, an elderly care provider can help them while they recover. Elderly care providers can remind them to take medications, encourage them to drink fluids, and make healthy meals for them. Elderly care providers can also help with housecleaning to prevent germs from spreading. For Elderly Care Services in Germantown TN, please contact the caring staff at Personal Care Services MidSouth today! This entry was posted in Elderly Care Germantown TN, Personal Care Tips and tagged Elderly Care Germantown TN. Bookmark the permalink.